Coachmen engineers devised a clever way to get 31 feet of living space in a 28-foot Class C motorhome. 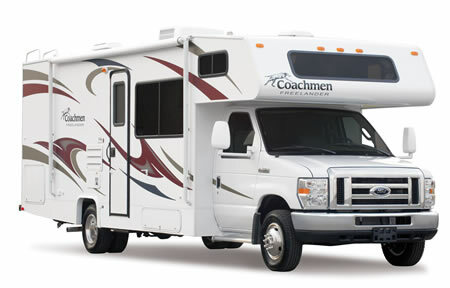 They created the Coachmen® Freelander™ 2700QS motorhome with a rear wall bedroom slideout. At the campground, the bed slides out the rear wall to become a true residential 80-inch queen bed. The room has plenty of floor space to walk around. For travel, an easy push of a button and the bed slides in, creating a day bed. The foot of the bed remains fixed in place; and the mattress at the head of the bed folds up to form the back of the day bed, giving the room a very usable, walk-around living area in the rear of the coach. Freelander 2700QS is a shorter and easier to maneuver Class C that gives families all the living amenities they usually can find only in models at least 31 feet long: a walk-around queen bed, a sofa, a dinette and a private toilet (a feature that's hard to find in a Class C this size). This coach also has a queen size cabover bunk. An option available is a front bunk ladder with a child restraint system to prevent falls from the cabover bed. In all, Freelander 2700QS comfortably sleeps six. But, Freelander is about more than just sleeping. It's about families who want to travel together and enjoy the RV lifestyle. For instance, in the kitchen designers created a smart and functional counter with a peninsula to make more efficient use of space. The kitchen has a three-burner range with oven, as well as a microwave oven, and a double-door refrigerator. The comfort lounge sofa in the living area has its own slideout, making the living area even roomier. An entertainment center with a 26-inch LCD TV, DVD player and Bose Wave® radio is an option for the cabover bunk. Even with the entertainment center, the bunk can still sleep a full-size adult. An all-new exterior graphics package enhances the eye appeal of the Coachmen exclusive sidewall design. The high-gloss exterior skin is laminated to a composite substrate that is moisture resistant and lighter weight than traditional wood panel substrates. The 2700RS also boasts 57 cubic feet of exterior storage, enough for all the gear needed for camping adventure. Coachmen designers and engineers have packed a lot into the Freelander 2700QS, but at the same time they have maintained a family friendly price on it. The manufacturer's suggested retail price begins at $85,560.